“Finland’s wild man of the jouhikko (bowed lyre)… dark swamp-blues grooves, his gnomic, Incredible-String-Band-paralleling vocals leading a massed chorus in a steamy, punky extension of the runo-song tradition”. 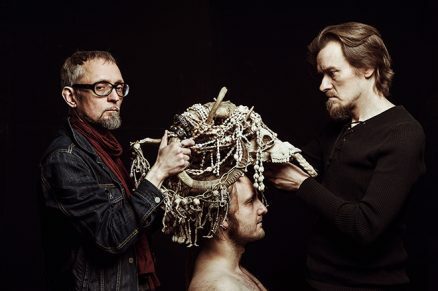 Pekko Käppi is a visionary Finnish folk music composer, singer and musician whose works have revolutionized the standards of playing the ancient Finnish instrument jouhikko, a bowed lyre. His music has been described as ‘swaying between the foul and lovely, dirty and pure incorporating elements from blues, rock and experimental archaic chaos into traditional songs that draw their inspiration (and bloodlust) from murder ballads of yore. As a singer and a researcher Pekko is well versed in the Finnish runo-singing tradition among the older layers of Finnish folk songs. Pekko will be joined by Tommi Laine on cigar box guitars, vocals and percussion and Nuutti Vapaavuori on cigar box bass and vocals.